The luxury of your own world class personal tailor available at your fingertips. The discerning customer will never wear an ‘off the peg’ shirt again. We are proud of our reputation as passionate connoisseurs, experts on tailoring, cloths and current trends. We are dedicated to individual client relationships and their satisfaction. 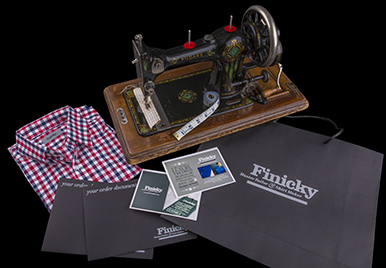 We strive to deliver the quality of a true tailor and client relationship. Our foundation is our world class master tailor with over 30 years experience, a dedicated craftsman, who oversees a small, family like team of highly skilled and traditionally trained assistants. Our third floor workshop is where the best of traditional workmanship and exacting standards combine with a modern approach and finesse. We source, and are privileged to, the most exclusive quality cloths from around the world. We only make premium quality shirts and our uncompromising high standards mean double stitching, collar and cuff durability and structure for example are standard in all of our shirts. We’re proud of our shirts and their ability to compliment the individual, enlightening our client to the luxury of excellent bespoke shirt making, and our ingenuity in using the internet to make our service available and affordable to all. By the nature of our trade every client is unique. We have honed our contemporary online ordering process to give our clients the luxury and assurance of a made to measure item, fantastic choice of cloths and cuts, and to allow them creative freedom. We can create quintessential classics or flamboyant individually conceived masterpieces... whatever our client desires. We believe that the perfect shirt compliments the wearer, is comfortable, fit for occasion and made to last. The only real difference to our traditional client, tailor relationship is that you need not make the trip to our third floor workshop but instead simply measure yourself once and we will look after everything for you from there.